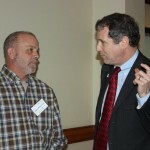 COLUMBUS — U.S. Sen. Sherrod Brown, D-Ohio, and U.S. Agriculture Secretary Tom Vilsack highlighted the 2014 farm bill in a sweep through Ohio Jan. 31 that included the Ohio Farmers Union annual meeting in Columbus. The House approved the conferenced farm bill Jan. 29 in a 251-166 vote. The Senate vote is expected late afternoon Feb. 4 or Feb. 5 (UPDATE: The Senate approved the farm bill Feb. 4 by a 68-32 vote.). 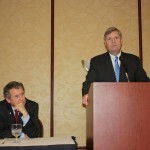 Before speaking to the Ohio farmers, Brown and Vilsack visited Plastic Suppliers, a Columbus-based company that makes plastic film from biobased materials, to outline how passage of the 2014 farm bill will create manufacturing and agriculture jobs through increased biobased procurement and promotion. Ohio has an emerging biobased-manufacturing industry, with nearly 130 companies already producing biobased products. Vilsack extended thanks to the OFU members and members of the National Farmers Union for their advocacy on issues in the new farm bill. The National Pork Producers Council and National Cattlemen’s Beef Association claim their members could face economic retaliation in the form of tariffs if the World Trade Organization finds the country-of-origin labeling law doesn’t comply with U.S. tradition obligations. 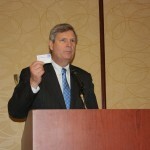 Vilsack said the Grain Inspection Packers and Stockyards Act, better known as GIPSA, faced a similar set of challenges. The Conaway-Costa amendment to the House bill, which would’ve directed the USDA to refocus its efforts on GIPSA regulations, was not included in the conference farm bill. 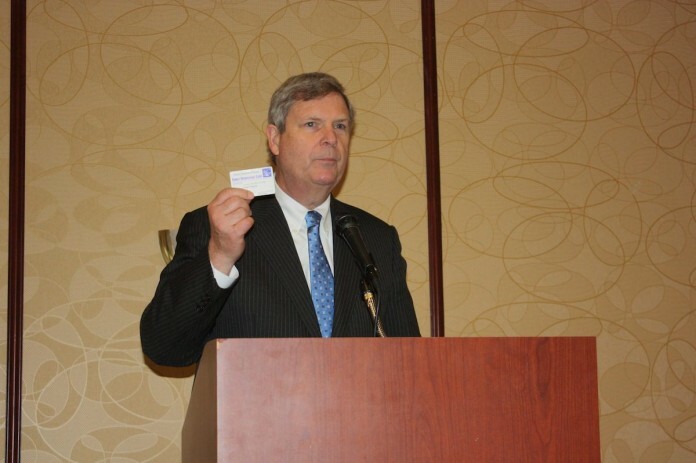 Vilsack said the new farm bill gives farmers additional opportunities on the credit side, and that farm credit needs to go to the people who need it, specifically beginning farmers and socially disadvantaged farmers. This month, the USDA also created a new microloan that allows new farmers, particularly returning veterans, to get start-up credit, in a simplified process. Vilsack pointed out the new farm bill eliminates direct payments, which was hard to explain to nonfarm residents, especially why it was needed at a time when prices were high. 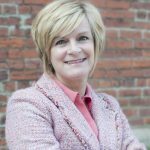 It’s replaced with a reliance on crop insurance, “which is easily explained,” and revenue protection plans. 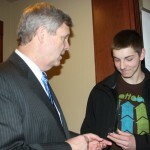 Vilsack said that urban or nonfarm connection is critical for farmers to make. Safety nets reduce the risk of farming to a reasonable level, “so people can stay in the business.” And, he added, that’s important because the U.S. doesn’t want to depend on others outside this country to raise our food. Vilsack said the success of the nation is rooted in agricultural productivity and efficiency, which is something nonfarm audiences also don’t realize. Back four or five generations, “everybody had to farm, everybody had to work the ground and the land,” the secretary said. That efficiency also lets Americans spend less on food than any other country. 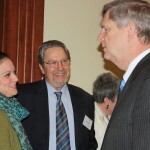 Vilsack said new trends like a biobased economy, value-added enterprise, or local and regional food systems, creates more market opportunities where producers are dealing directly with a customer. “This is the first farm bill that I’m aware of that actually creates opportunities that are specifically designed for smaller sized operations,” Vilsack said. Vilsack said the farm bill also creates a research foundation to leverage public resources with private, university and nonprofit resources to increase the amount of research that’s being done to create new products and new businesses, for example products using biomass. The farm bill, he added, is not simply about SNAP (food stamps) and farm programs — it’s a jobs bill, it’s an infrastructure bill, it’s a energy bill. But the ag secretary also challenged the OFU members to continue to build coalitions within agriculture. 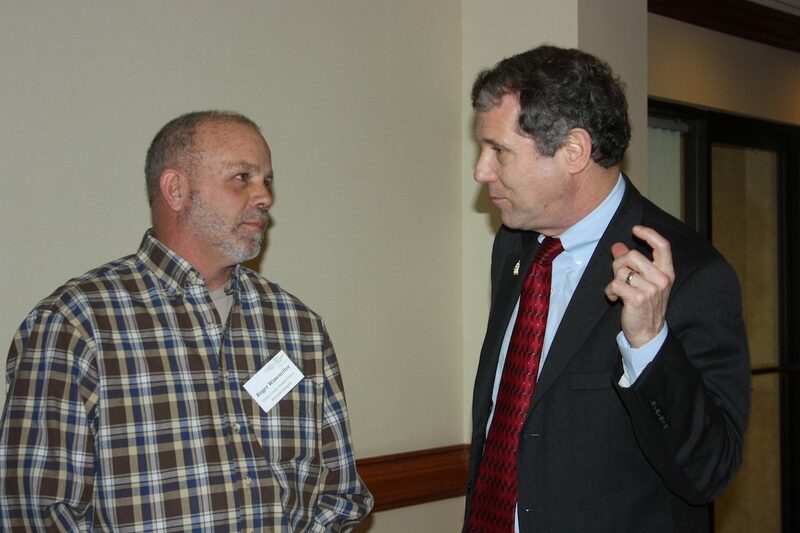 SEC AG and “Herrod” Brown would not know a manure pile if they tripped and fell in one. In their Orwellian “double-speak” they would say they smelled “heavenly.” So, when they say a $1,000,000,000,000.00 bill is “heavenly” and will be ab economic “driver, rest assured it will be a DISASTER. Just like any other mega-feel good “rob the tax payer” act will do. This negotiated farm bill may be worse than even feared. You realize, of course, that 80% of its spending goes for the Food Stamp (whoops! gotta be PC) SNAP Program. Farmers and ranchers get the 20% of the “entrails” of this bill. Nothing to see here folks–just move along–keep paying those quarterly taxes, FICA, SS, unemployment, worker’s comp, realty taxes, feed, seed, fuel bills…ad infinitum. It always is, of course, “…for the children.” And who can argue against THAT? Onward! Forward! The Collective Rules! Down with Individuality! Hope & Change FOREVER! I tend to disagree with you two above posters. Although I think every family should get its money through working and the economy, the truth is that our politicians have sold large parts of our economy to China. Bill Clinton and the republican’s push of NAFTA has pushed Waltons and Walmart to the richest of the rich while Walmart undercut U.S. supplies in favor of cheaper Chinese goods. We have created a nightmare scenario where China’s power is largely the result of this policy. The communist leadership has captured the benefits of trade and paid its workers so low that they can not afford U.S. goods. This is one of the main causes of low employment in the U.S. We have outsourced our production and all its jobs. With this policy we have created a large group of people who need govt. assistance in the form of SNAP benefits just to eat. I will agree that the large subsidies in the Farm Bill are a result of money in agribusiness buying public welfare and claiming it as something that benefits small farmers. Let us get real. The corporate welfare in this bill with AGIs of over 900K and the loopholes of multiple entities receiving Farm Bill welfare is a result of the leadership in both parties being on the take. They would rather keep corporate welfare in the Farm Bill to the wealthy because they get paid off and lobbied to do so. They are simply on the take. We need a farm bill and help for families trying to get minimal food for their families but the structural problems paid off politicians has been the root cause. We elect them and keep them in office so it is really our problem, the voters.